We are all familiar with our physical bodies and their functions, but often less so with our bodies subtle energy systems. Seen from an energetic perspective each of us are made up of layers of vibrating energy, each of which has their own specific vibration and purpose. How Does Our Physical Body Relate to Our Subtle Energy Systems? The physical body consists of energy that vibrates very slowly, which is why it appears to our physical eyes to be solid. This has lead us to focus mainly on the physical aspect of ourselves without recognising that it is actually created from and sustained by the energetic layers that are outside of our normal perception. How Do Our Energy Systems Inter-Connect? Our energy points, energetic layers and subtle bodies create an interconnected field of energy around the physical body that is commonly known as the auric field. Each subtle body connects into the physical body via an energy point or chakra, which directs the energy into the physical body via the meridian system. Our Chakras are subtle energy points, literally wheels or vortexes of energy. They act as energy gateways or energy exchange points. We have several hundred of these energy exchange points within our energetic systems but the most well known ones are the seven which are etherically connected into the spinal column and head. When they are healthy and functioning properly the chakras act as gateways for vital life force energy from the subtle bodies to enter the physical body via the nadis and meridians, while at the same time providing an exit point for lower frequency energy to be released back into the subtle bodies for transmutation. The physical body is dependent upon this vital energy flow to maintain optimum wellbeing. Chakras can become blocked by long held negative states - rigid thought patterns, negative emotions, toxins etc. In addition to its other functions each of the seven main chakras represents a level of consciousness or developmental stage of life. How Can I Re-balance My Chakras? The term subtle bodies describes the various layers of vibrating energy that make up a human being beyond the obvious physical layer. Although they cannot be seen by the physical eyes, they can be seen psychically through the third eye or with the aid of Kirlian photography. As you move outwards from the physical body into the auric field, each subtle body vibrates at a slightly faster vibration than the one before it. So the etheric body is faster than the physical and the emotional body is faster than the etheric body etc. Each of these different layers of energy, including the one we recognise as the physical body inter-penetrates the others to work as a complete system. Our subtle energy bodies include the: Etheric Body, Emotional Body, Lower Mental Body, Higher Mental Body, Causal Body, Soul Body and the Integrated Spiritual Body. 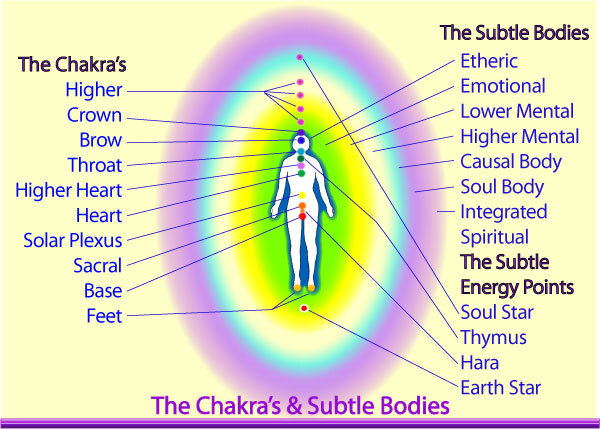 You can find out more about each of these subtle energy bodies here: Our Subtle Energy Bodies. Within our subtle energy system there are also many energy points or centres, each with their own particular focus and function. As well as the Chakra points that we have already looked at, there are also other subtle energy points that are important for us to activate and develop. These include the: Earth Star, Hara, Thymus Point & Soul Star. You can find out more about each of these energy points here: Our Subtle Energy Points. What Can I Do If I Need Help To Re-balance My Subtle Energy Bodies and Points?